Disclaimer: I received an ARC of this book from tor.com’s Sweepstakes. This has in no way affected my review. It’s just a great book. Anti-warning: Last First Snow is the fourth book published in the Craft Sequence, but it occurs before the first three chronologically and can safely be read as a standalone without any context, and thus it—and this review—will not spoil the other books. Last First Snow both is and is not a prequel in the traditional sense. It chronicles the story of some of the main characters of other books in the Craft Sequence before they appear in their own books—though I won’t say who, in case you’ve not read those books yet—but it also has its own completely self-contained story-line which wraps up quite well by the end of the book and while it shapes the history of the later books and their world, it’s not the “How things came to be” story that, say, the Star Wars prequels tried to be. I think it benefits from this, as well. Gladstone allowed himself a fairly free canvas with his characters and his plot, and while he did have end some of the storylines in particular ways to set-up for the other books, he had a lot more freedom to make the plot match the character decisions and who they really are, instead of the other way around, the trap I feel most prequels fall into. It feels like I’m repeating myself over and over again when I talk about how interesting Gladstone’s wildly varied cast of characters is, but it always bears repeating. In Last First Snow, we follow a magician/lawyer, an undead skeleton, and a priest of dead gods along with those they are working with, including a man who reminded me of Iron Man every time he was on-screen, two cooks, and an insurance agent. Getting to know this new cast—and the familiar characters at a different point in their lives—was, as always, a pleasure, and something I have come to expect from a Gladstone novel. The beginning of the novel is incredibly strong, and within the first 30-40 pages we’re introduced to all of the major players in the novel and the main conflict—and at that point, I wanted to root for all of them. The set-up utterly hooked me, and the gray moralities it teased at were fully realized by the end of the book—with elegant shades of subtlety that made me look at old and new characters in quite a different light. The plot, too, drives itself along quite nicely, and I never found myself bored, and it was difficult to put the book down to make myself dinner. (The nap I accidentally took while reading was due purely to walking 10 miles in Texas summer heat, not the book.) But the book isn’t just driven by its plot, and it combines that plot with a brilliant, powerful ending, which had some truly awesome surprises, and made it one I would love to see on screen some day. One of the other ways in which Gladstone continues to improve is his prose, and there are a huge number of great descriptions and otherwise highly quotable lines in the book, though I managed to limit myself to only quoting a few of them on Twitter this time. 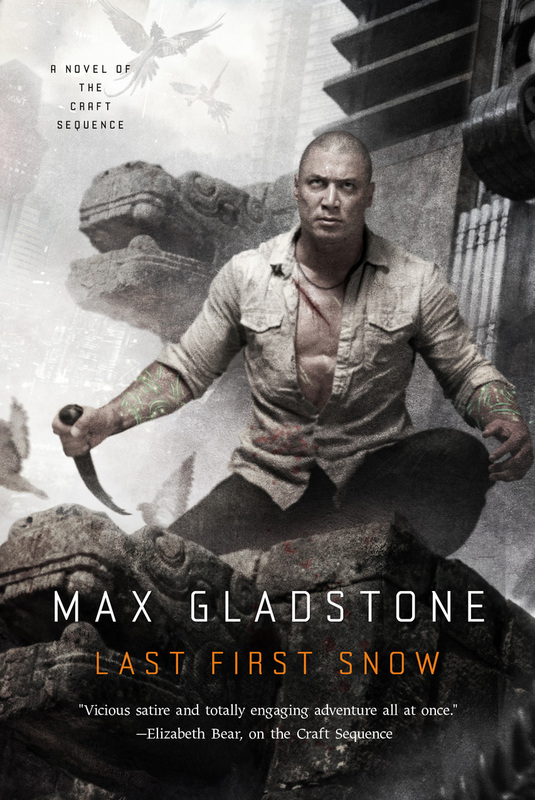 In summary, Last First Snow by Max Gladstone is a great starting point for the Craft Sequence—or if you already love the previous books, you really have to pick this one up because it is undoubtedly my favorite one so far. The plot moves nicely, the characters are as diverse and interesting as I’ve come to expect from all of Gladstone’s work, and the ending is a truly spectacular showdown that I sadly can’t talk about too much because spoilers, and the book remains intensely quotable. I give it five of five stars, and I’m anxiously awaiting more entries in the sequence.